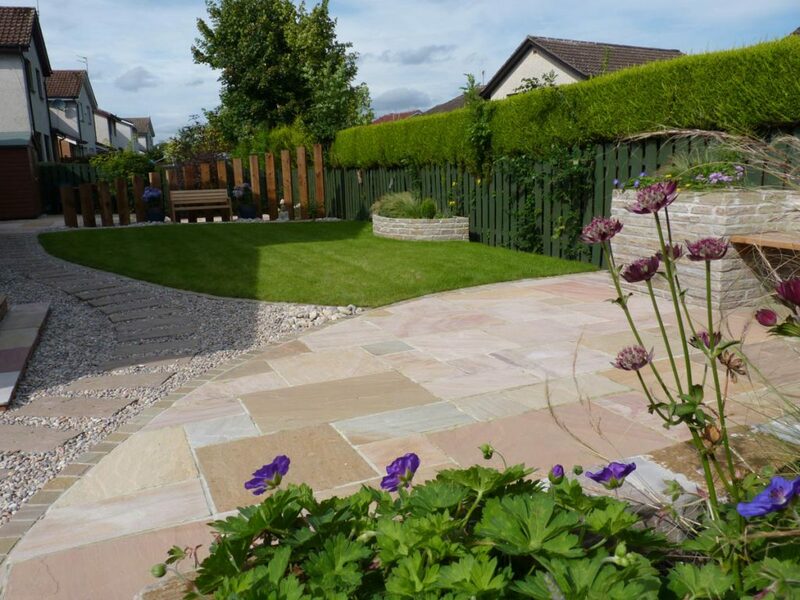 Our clients had recently had an extension added to their house which meant they lost their existing patio and building work caused damage to the garden. 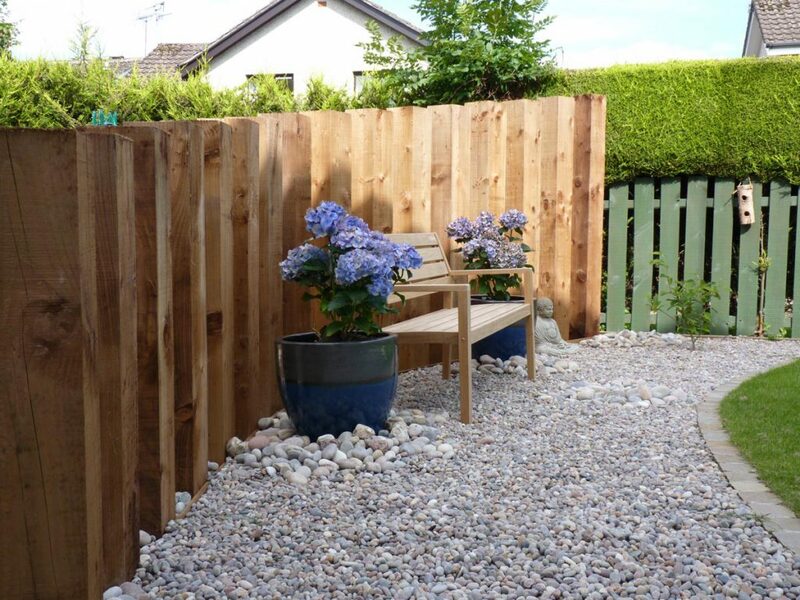 They were looking to transform their boggy garden which had little interest left and nowhere to sit into a haven for entertaining and relaxing. 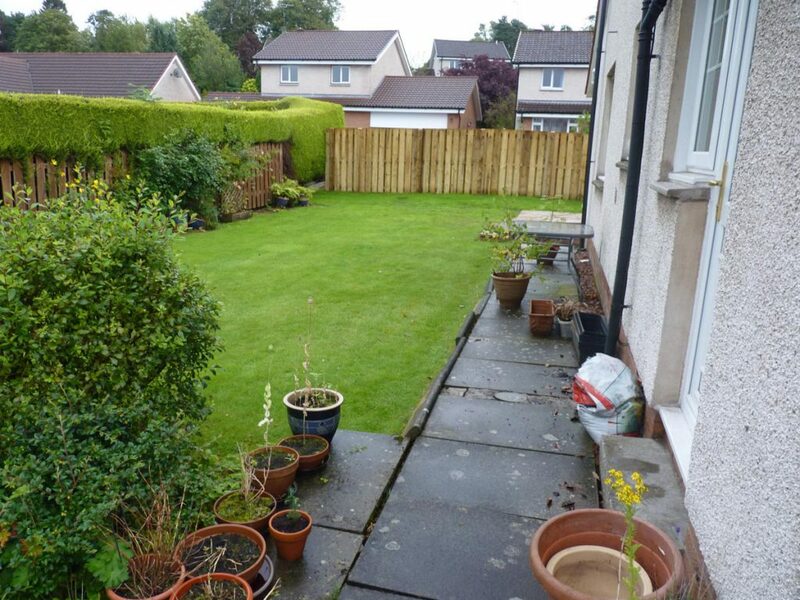 The area at the bottom of the garden was very soggy and damp and the side of the house was not being used for anything. 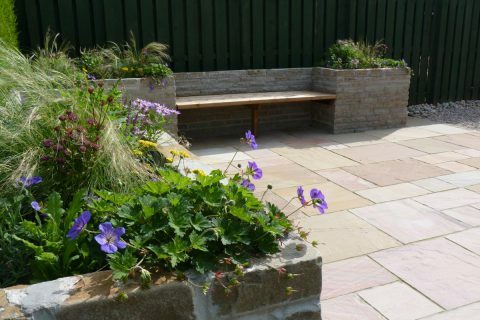 The drying area was getting overgrown and the narrow path of concrete slabs along the house was past its best.The clients wanted to be able to have somewhere they could have family and friends round to enjoy the garden with them as well as a choice of areas where they could relax outdoors. 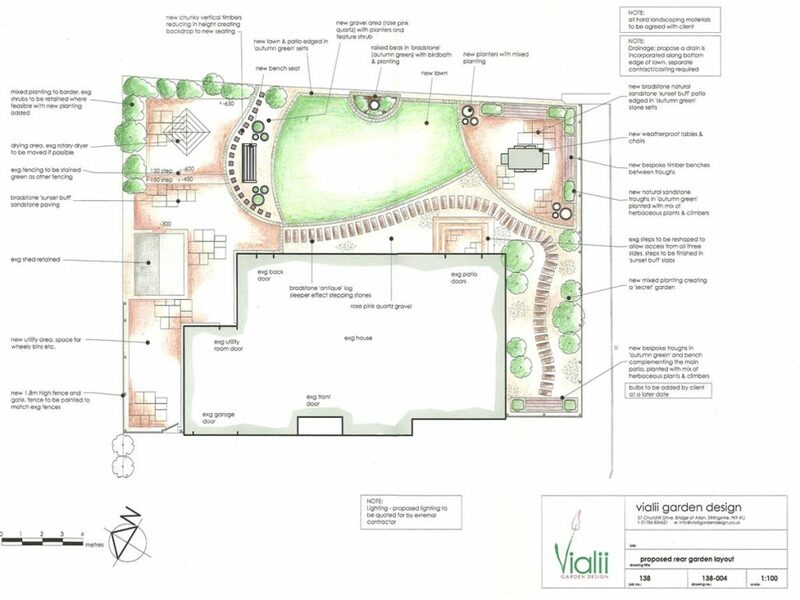 "Michael and Jill are easy to work with and passionate about what they do. 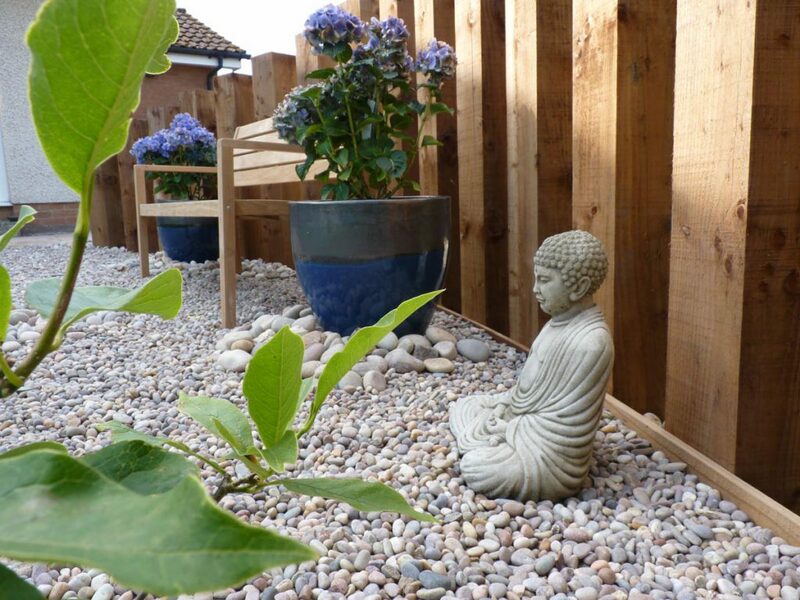 The end result is the garden we dreamt of; one that we can be proud of; which we enjoy using and that is going to give us many years of pleasure. 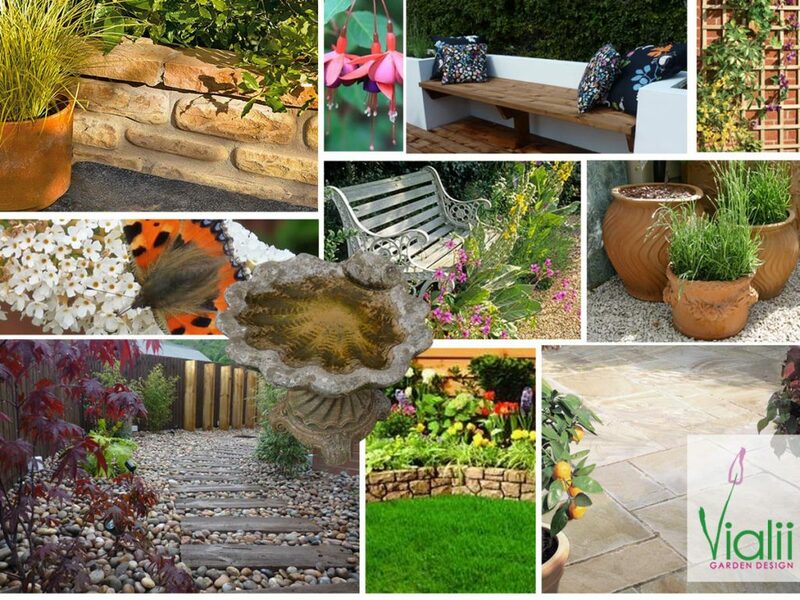 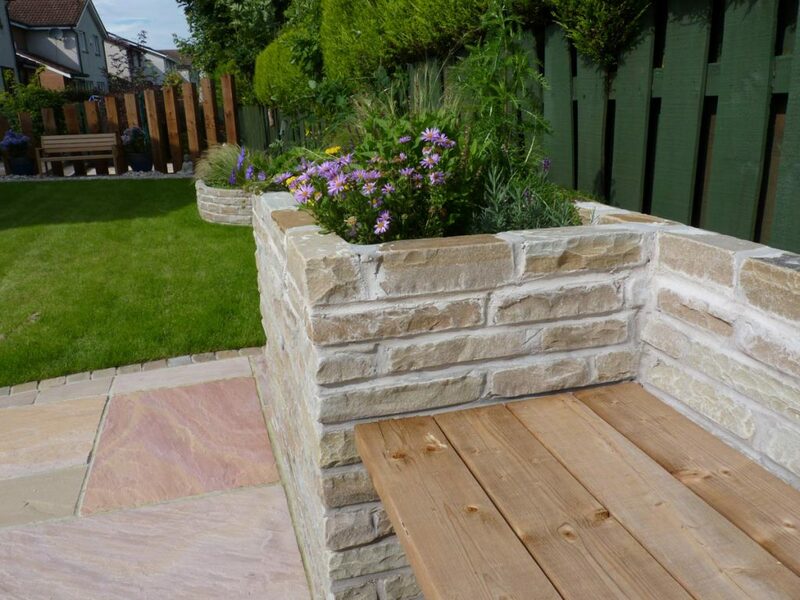 It will be exciting to see it mature and grow"
Good quality, natural materials were used to create the new garden. 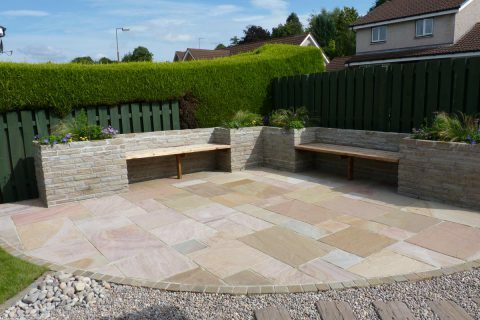 The patio was built from “Sunset Buff” sandstone, a warm colour with beautiful variations through it. 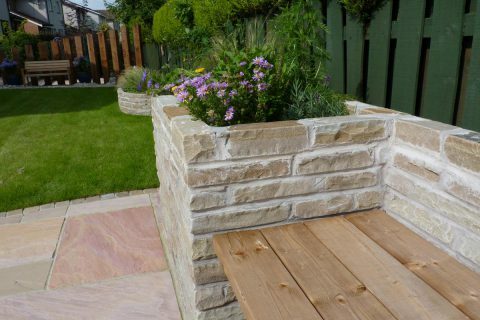 To complement this, the troughs were built in “Fossil Green” sandstone. 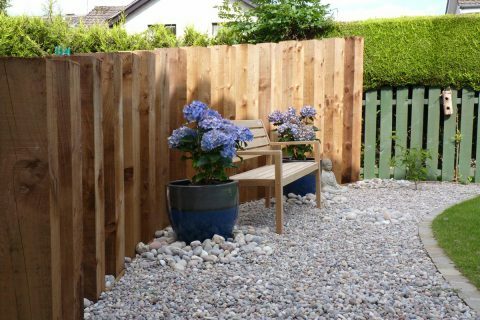 Bespoke wooden benches between the troughs offer additional seating space as well as the sizeable patio area. 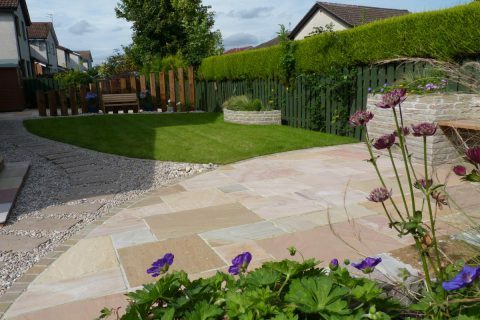 Around the garden, Scottish pebbles of varying size were used and sleeper effect stepping stones were selected to create a meandering path leading you round the garden. 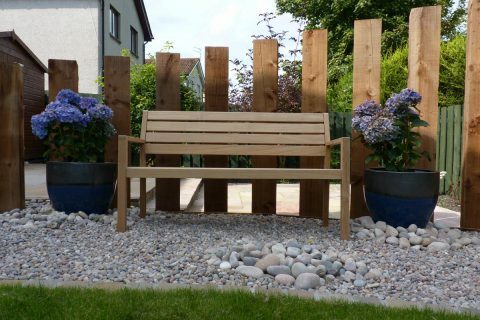 A vertical feature made from chunky sleepers was created at one end of the garden in order to create a stunning focal point as well as providing a shelter from the buffering winds. 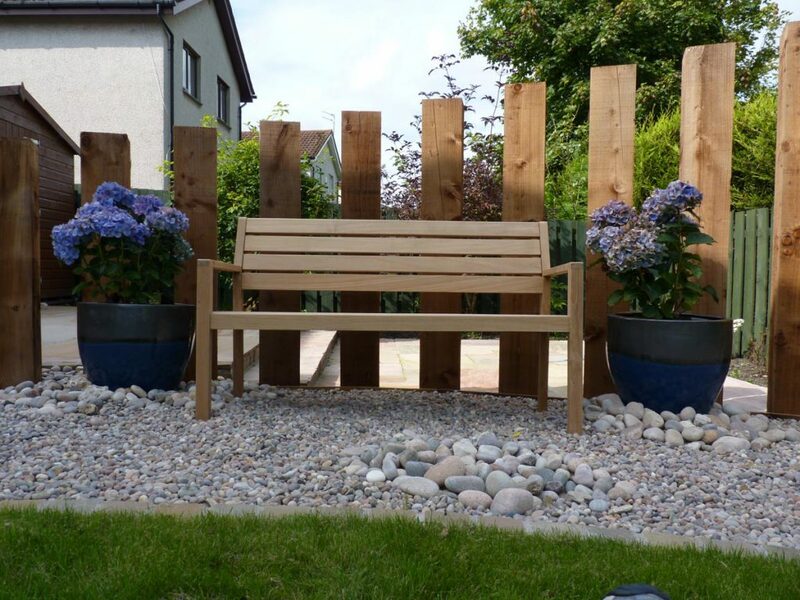 A lovely wooden bench sits in front of this with blue ceramic pots filled with hydrangeas either side. 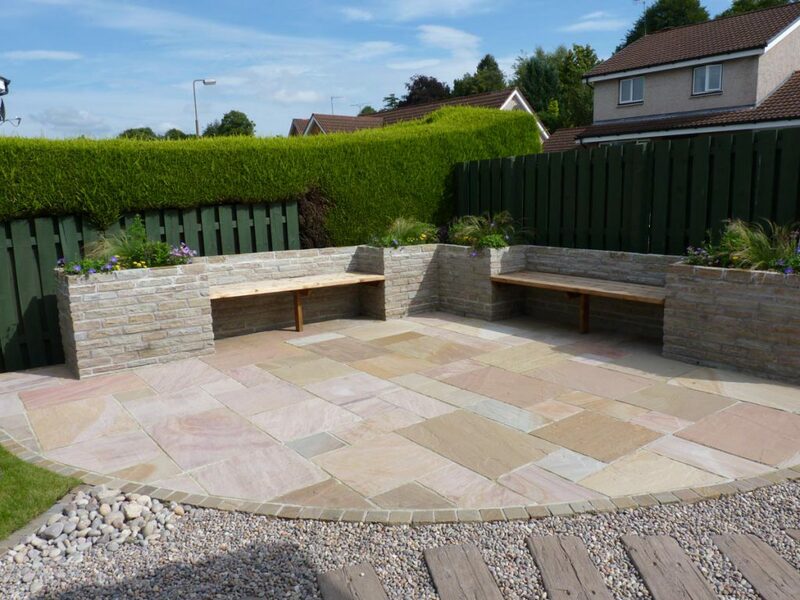 At the side of the house, the meandering path leads to further sandstone trough with another bespoke bench offering an alternative place to relax in the garden. 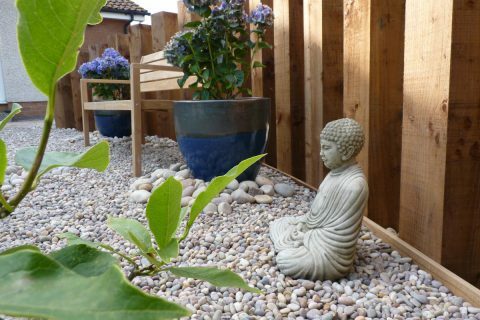 More pots with feature shrubs are placed in groups in this area adding colour and interest. 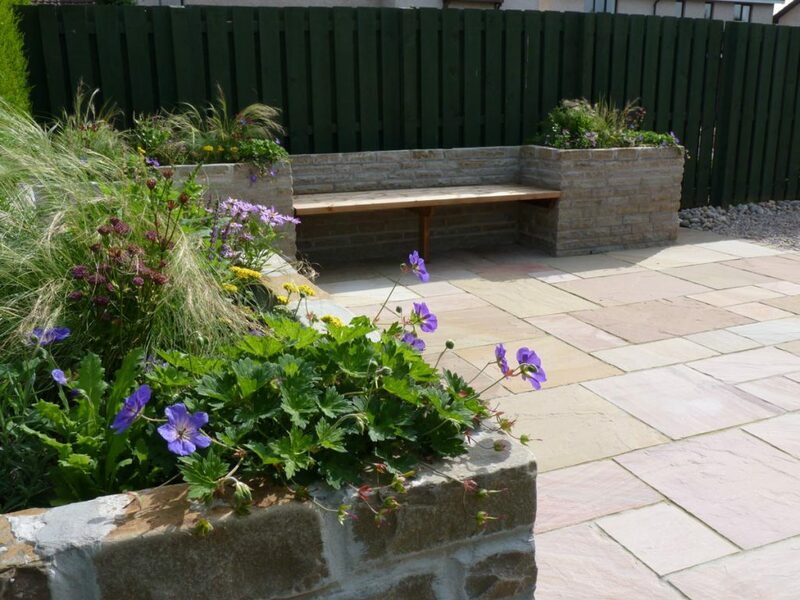 The planting was mostly restricted to the troughs and pots to make the garden low maintenance. 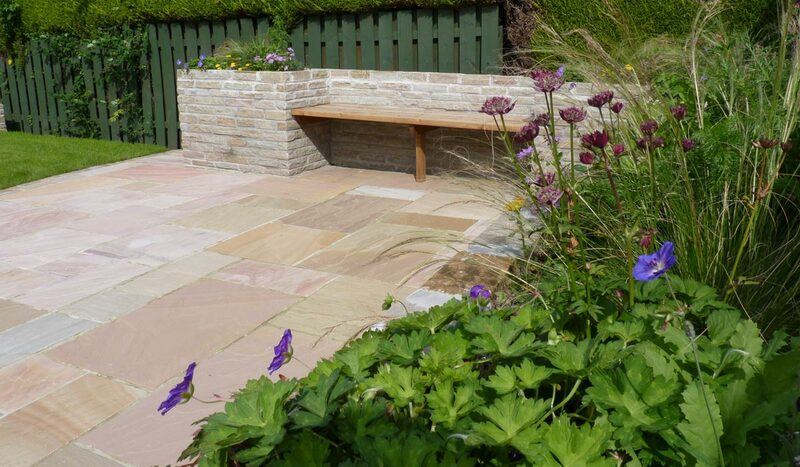 A floaty mix of plants such as stipa, astrantia, achillea, geranium and hydrangea provide colour, interest and texture as well as attracting wildlife into the garden. 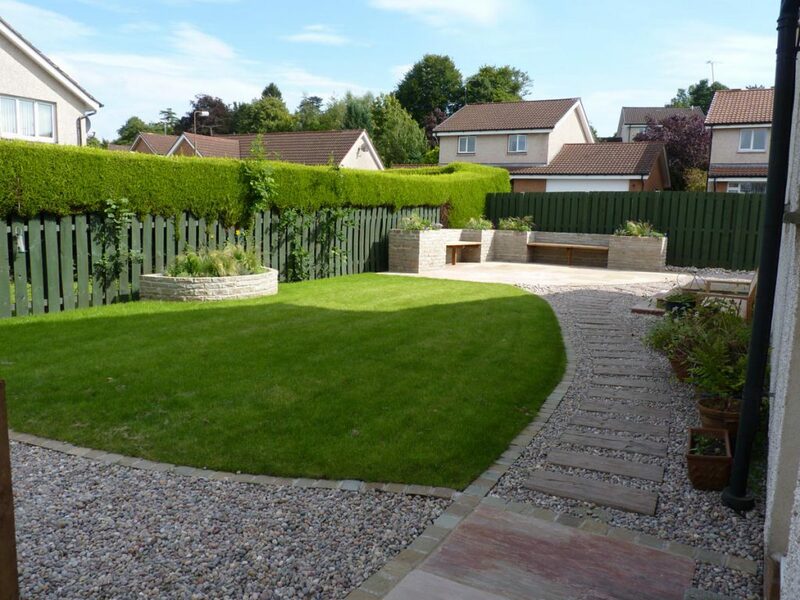 A new large lawn providing plenty space for entertaining was created, increasing the height at the bottom to improve drainage.